The United Nations (UN) seeks stronger global efforts to end Rohingya crisis and ease burden on Bangladesh by sharing responsibility, officials said. "A year has passed; we must act globally to stop this crisis," said UN Secretary General Antonio Guterres in a twitter message on Saturday. The UN chief said the horrific stories of suffering he heard last month from Rohingya refugees in Bangladesh remain vivid in his memory. "The burden of responsibility needs to be shared by the international community," UNHCR Spokesperson in Bangladesh Joseph Surja Tripura told UNB. He said it has been a very challenging year, with the UN and its humanitarian partners working closely in support of the government of Bangladesh to provide essential life-saving services to Rohingya refugees during the fastest-growing humanitarian emergency in more than two decades. "Many families arrived with just the clothes on their back and spent their early days sleeping under the open skies," Tripura recalled. One-year anniversary of the Myanmar’s military launch of an operation in Rakhine State in response to what Myanmar says, attacks by the Arakan Rohingya Salvation Army on police posts, was marked on August 25. Humanitarian agencies have provided life-saving services to families: including shelters (now upgraded so families are better-protected to cope with the monsoon season); food, water, protection assistance, health and educational facilities. "We need to continue to work to try to ensure the Rohingya have a better future," said the UNHCR official. He said UNHCR is ready to provide technical support to the governments of Bangladesh and Myanmar to find a long term solution to this crisis. "We do not, however, believe that conditions in Myanmar are currently conducive to return. It is crucial that any return takes place in safety and dignity, and is sustainable," he said adding that Rohingyas have to decide for themselves when they feel it is safe for them to return. Responding to a question, Tripura said the government of Bangladesh and its people have shown tremendous generosity in keeping its borders open and assisting thousands of families fleeing violence. The burden of responsibility needs to be shared by the international community and rojects have been launched that will assist both the Rohingyas and local host communities affected by the influx. These include environmental projects – including those that help with reforestation; and reducing the dependence of firewood for cooking through the distribution of cooking fuel, which will also be extended to the affected host community, he added. The monsoon season was another challenge, Tripura said. A massive amount of mitigation work was carried out to protect refugees from the high risk of landslides and floods. UNHCR, with its partners, have built 32 km of roads and footpaths; repaired or completed 96 km of drainage; built 45 km of reinforced stairs; 64 km of retaining structures and distributed nearly 80,000 pre-monsoon kits to help families anchor their shelters to protect themselves during the heavy winds and rains. In addition, he said, UNHCR and IOM, UN Migration Agency, have helped to relocate nearly 25,000 individuals from high risk landslide areas in the refugee settlements to new, safer areas. The massive amount of work undertaken to mitigate the risks of landslides and floods, working closely with the government, the army and the emergency services, has paid off, helping to protect thousands of lives. "The challenge now is to how to move families to better, flatter areas and to try to decongest the massively overcrowded refugee settlements," said UNHCR Spokesperson in Dhaka. He said UNHCR appreciates the generous support they have received from donors, which has been crucial in helping them to quickly respond to the enormous humanitarian demands. "However, ongoing support is urgently needed to keep vital services going," he said. The inter-agency Joint Response Plan, seeking nearly $951m for the Rohingya humanitarian response, is only 33% funded. 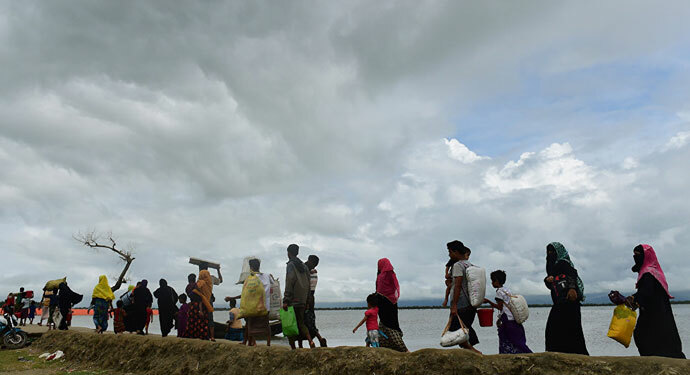 "We urgently need more help to continue delivering lifesaving assistance to ensure that the Rohingyas, who rely entirely on aid, do not face new risks," Tripura said. The UNHCR, he said, pays tribute also to the enormous and inspirational resilience of the Rohingya themselves and the role they have played in helping to strengthen their community; in volunteering to make the settlements safer. Her goal is to draw attention to the plight and resilience of Rohingyas she met in Bangladesh recently, UK office at the UN and UN Refugee agency tweeted. In the joint statement, 132 sitting MPs from five countries - Indonesia, Malaysia, Philippines, Singapore, Timor-Leste - including 22 members of ASEAN Parliamentarians for Human Rights, called on members of the UN Security Council (UNSC) to refer the situation in Myanmar to the International Criminal Court (ICC).